« LA PAZ! And the end of Operation: Fish Tacos! For those interested, I have compiled all posts and photos from Stage 2: Baja California (AKA Operation: Fish Tacos!) here. Also, there is a new ZackTracker update available here. 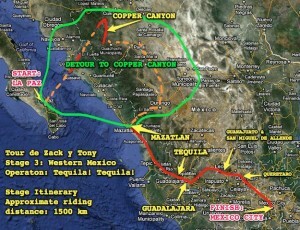 The third stage of the Tour De Zack, also known as Operation: Tequila! Tequila!, will take me from La Paz, Baja California Sur, Mexico across the Sea of Cortes (by boat, not by bicycle) to Mainland Mexico. 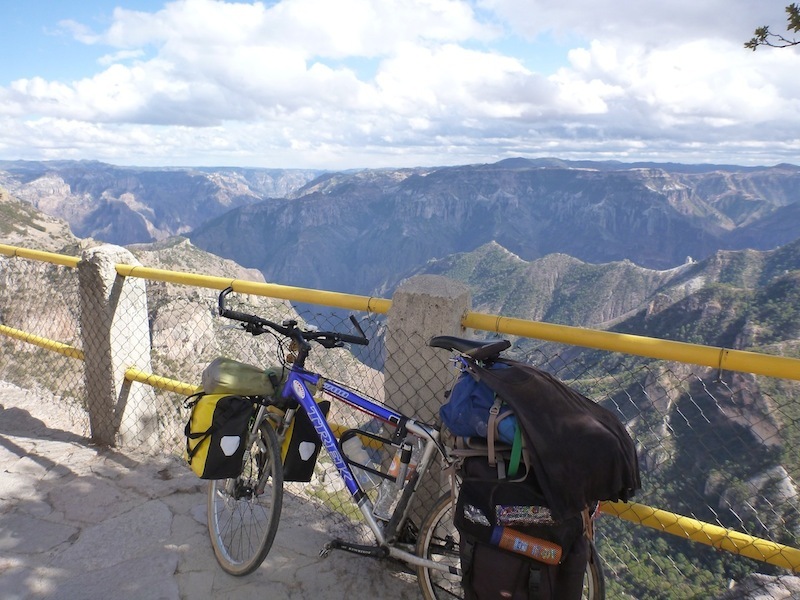 Once on the mainland, after a little side jaunt up La Barranca del Cobre (Copper Canyon), I will be riding the 1,200 km from Mazatlan to Mexico City via Tequila, Guadalajara, Guanajuato, San Miguel de Allende and Queretaro. 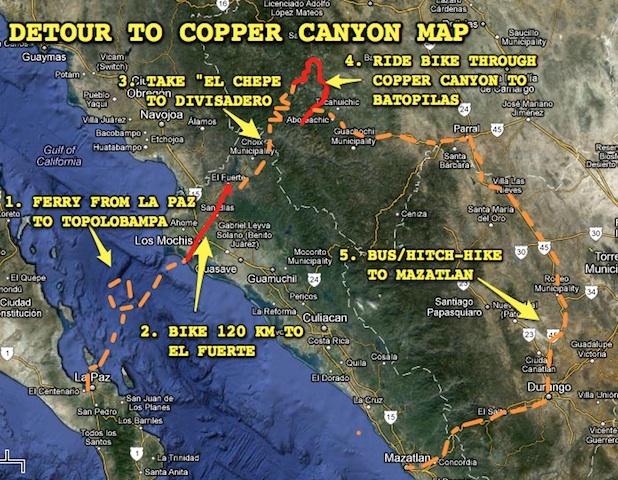 Total riding distance for this stage is expected to be about 1,600 km and If I keep moving I’d probably arrive in Mexico city in mid to late March. That’s if I don’t get stuck in the Barrancas for a few weeks. The main theme of this stage is that we are essentially back in civilization! I’ve left behind the desolate deserts of Baja California, and once I set out from Mazatlan I will be passing through a more constant stream of pueblocitos, towns, and cities, along with (I hope) a changing beautiful landscape. Tequila country is meant to be beautiful with it’s blue agave fields spread out under an afternoon sun, and I fully intend to learn as much as I can about the mexican spirit while I am there! Guadalajara is Mexico’s second largest city and is meant to have a vibrant social life set amongst gorgeous colonial architecture. Guanajuato is suppose to be a lively town and is also a UNESCO world heritage site that supposedly has retained its charm despite growing numbers of tourist. San Miguel de Allende is extremely popular with US expats, but is still suppose to be a nice town to visit and it is on route. Queretaro is a colonial city also on route, and it’s historical centre is supposed to be enjoyable with string of small plazas connected by anadores (pedestrian walkways. First though, I will be sticking to the wilderness for a little bit longer. Tony checks out the view of copper canyon from the platform at Divisadero. 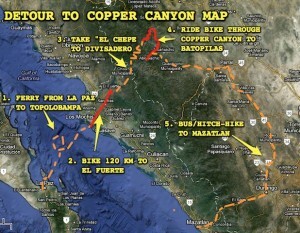 Superhuman Indigenous Tribe, Drug Cartels, and Deadly Canyons… This I’ve got to see! I am currently in Creel, a small mountain town in the mexican state of Chihuahua and a staging point for exploration of one of the most isolated, mysterious, largest, dangerous, and deepest canyon systems in the entire world: La Barranca del Cobre – I’ll fill you in on how I got here from La Paz in another post. 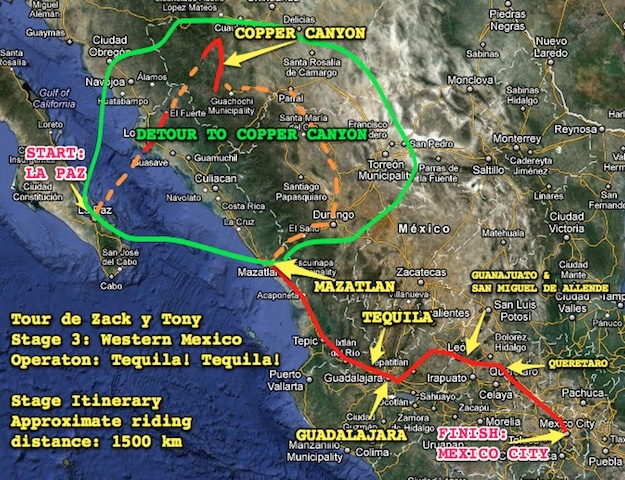 Copper canyon, as it is known in English, is a canyon system that is deeper and more extensive than the Grand Canyon itself with a depth of over 2,000m in some places. It’s the kind of place that can make you sick of superlatives. Tony and I ride in tomorrow. It is cold in Creel which is at 2400 m elevation. Hence the wood stove. I like the wood stove, I mean check this out: What other device can you 1) heat up your room, 2) dry your clothes, 3) heat up water, and 4) cook your breakfast, ALL AT THE SAME TIME! It is also home to “the running people”, as they are often called. The Raramuri, or the Tarahumara as they were incorrectly named by the Spanish, are a quiet indigenous people that have been living in the canyon and in the caves on the sides of the cliff for hundreds of years ever since they ran away from the arrival of the Spanish Conquistadors in the 1500s. Tales of their running abilities are legendary, as they can run 100s of miles wearing homemade sandals in one of the most difficult environments in the world. And they don’t just go the distance, they are fast. In 1993 and 1994, a handful of Raramuri were invited to compete at the “Leadville 100”, a 100 mile, high altitude (3000 m) race in Colorado Rockies. The race was (and still is) one of the most dreaded and most famous races in the world of “Ultrarunning” – as the extreme sport of running distances 50 miles or longer is called – and both years, the Tarahumara smashed it, taking first place both times and in ’94 destroying the course record with a time of 17h30m. They are tough cookies, and it’s no surprise when you read about where they call home. 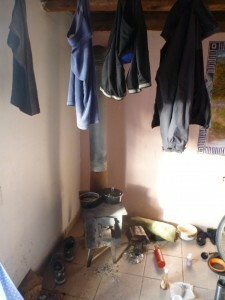 The Barrancas have been featured in shows and movies like the popular Man vs Wild series where the host Bear Grylls generally jumps out of planes into some of the world’s most inhospitable environments and demonstrates survival techniques before drinking his own urine and going to bed in a dead animal carcass. The Barrancas also served as the backdrop of the popular running book and soon-to-be-movie Born to Run: A hidden tribe, super athletes, and the greatest race the world has never seen. Yesterday I started reading Born to Run and I finished it today less than 24 hours later. A great read, it makes me want to start running barefoot, eat pinole and pozole, and run naked through the woods. 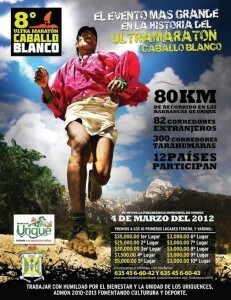 I was also interested to read that that first ultra race in the Barranca del Cobre took place back in 2004. I say “first” because the race implausibly became an annual event and has grown to over 300 runners. 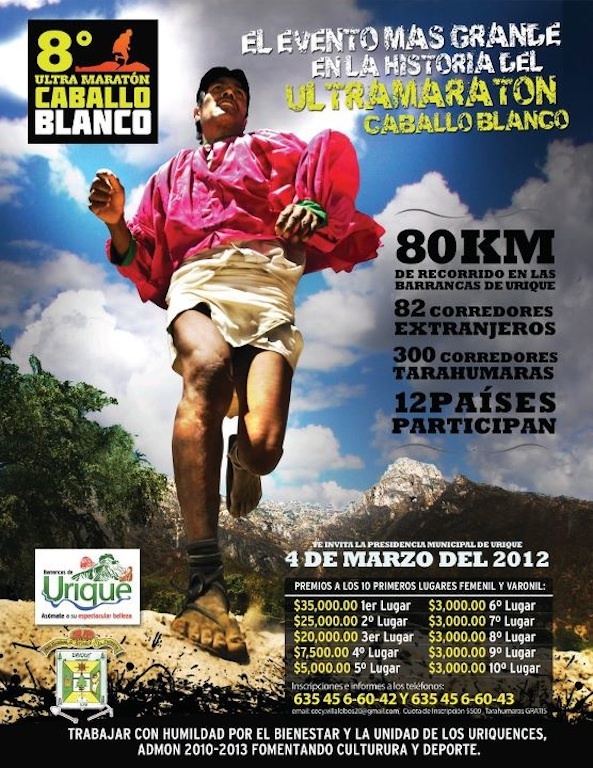 I know this because today in Creel, I happened to spot a poster on the window of a tour company advertising the 8th annual Ultra Marathon Caballo Blanco (White Horse Ultra Marathon). Turns out that the race is taking place on the 4th of March, just two and a half weeks away.